Abdul Jabbar Gull carves directly in wood, forms that are starkly distinctive, endowing the individual pieces with an extraordinary sense of the organic con-texture of the figure. In the purity of subtle curves the columnar structures are individualized by the slight tilt of a head that carries the barest suggestion of facial features. The sculptor’s individual style leans towards Abstraction without losing the figurative representation. The metaphysical significance of remote times act as a base for the modern artist to adapt to his needs in an era that sees his growing alienation from nature. Gull’s work has a timeless quality that links it to the Cyclandic art of the Aegean civilization, a spiritual searching that links him to the 3000 year old civilization and stretches back even further in a quest that joins past with present. 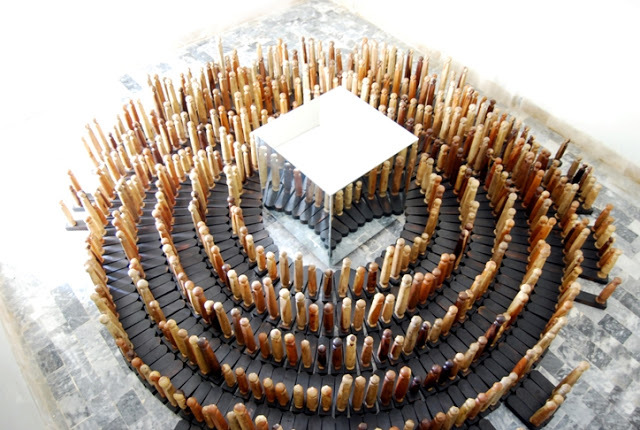 In a major exhibition of his work Gull groups the approximately 18 inch high carved figures into circles, the symbol of the cosmos and in many cultures symbolizing the creative principals of the universe. Forming Circle-1, Circle-2 and Circle-3, the forms are suggestive rather than realistically described, the distortion evoking an underlying energy and the power of the human body. Similar carved forms lined up behind a single leader appear as a horde waiting as though to be judged; or perhaps they are the judges standing upon us. Each solution seems to raise further questions. There are no differences in face or form, no mitigating circumstances; each will bear the consequences of his actions. These are pieces that collectively assume a strong presence. Working with larger carvings standing over five feet high the sculptor is consistent in his preoccupation with systematic proportions. What he achieves are powerful three-dimensional forms that exude mystic sentiment, transcending matter in the serenity of prayer. Hands facing outward connote to an age-old ritual and on another level, appear to shield the forms. The subtlety of the grain of wood appears as the lines of a palm in one hand, maintaining the characteristic refinement of the sculptor’s style. Wall based, carved relief work surpass rituals, exuding an overwhelming sense of the ultimate essence of their actions. Both `Symbolist’ and `Realist’, in his spiritual quest the artist searches for Truth, in others, in his surrounding and in his self. Gull, whose roots lie in the Sindh regions of Pakistan, has been familiar with the properties of wood since childhood. In his father’s workshop he learnt to recognize the differences in various types of wood, ran his fingers over the grain of the wood and felt the pulse within. Changing his subject from design to sculpture, somewhat isolated him as an art student studying at the National College of Art, Lahore. Even then he showed a commitment that has led him to an individual path, one that encompassed a season in Africa where he searched the parks for discarded tree trunks for his work. One of the vanguard of young sculptors who have emerged in recent years in Pakistan, Gull is making inroads in this neglected discipline. Without a recent tradition to follow, he sets his own standards disregarding the as yet, limited public awareness. Teaching sculpture at the Indus Valley School of Art and Architecture, he strives to imbibe his students with an understanding of the three dimensional discipline, man’s earliest venture into creativity.